The world's oldest known wild bird continues to astonish researchers at the remote Midway Atoll National Wildlife Refuge. 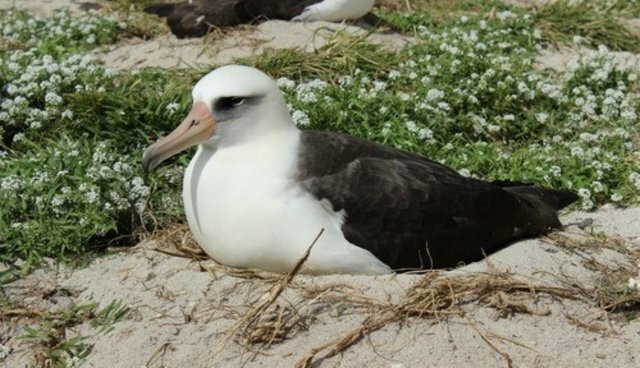 That's in part because of her longevity -- the Laysan albatross is at least 63-years-old, and probably much older -- but mostly because the albatross is still rearing babies. Her recently hatched chick was first spotted this week by the refuge's visitor services manager, Ann Bell. Wisdom was dutifully doting for the furry brown baby, keeping it warm and safe. It's remarkable considering that Wisdom, who spends the non-nesting season foraging over a vast parcel of the Pacific, was first banded as an adult in 1956. "As the world's oldest known bird in the wild, Wisdom is an iconic symbol of inspiration and hope for all seabird species," Dan Clark, refuge manager, stated in a news release. "She provides to the world valuable information about the longevity of these beautiful creatures. "In the case of Wisdom, she has logged literally millions of miles over the Pacific Ocean in her lifetime to find enough fish eggs and squid to feed herself and multiple chicks, allowing us to measure the health of our oceans which sustain albatross as well as ourselves." To be sure, Wisdom is a wise old albatross. She has survived year after year despite a horrible ocean pollution problem that has killed thousands of the sea birds, young and old. Said refuge biologist Pete Leary: "It is a poignant and overwhelming reality that plastics discarded at sea float, from toothbrushes to millions of bottle caps, and are used as a substrate for flying fish to attack their eggs, a food highly prized by foraging albatross and ultimately regurgitated into the chick's mouth." Leary added that a chick's survival is solely dependent on the health of its mother and her mate, which combine to provide food and protection. Midway boasts the world's largest population of Laysan albatross, soaring surface feeders with six-foot wingspans. 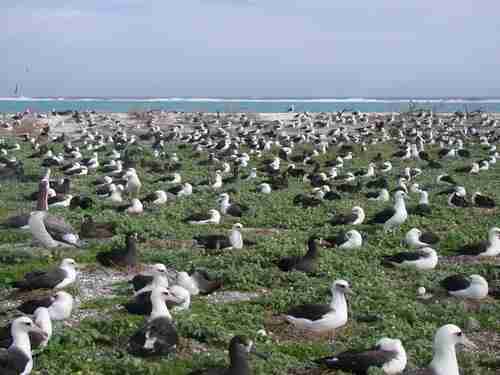 About 71% of the world's population nests at the atoll, which is most famous for the Battle of Midway and the atoll'spivotal role during World War II. When the birds are not nesting, they soar in wind currents for thousands of miles while foraging. They do this for five months before returning to the same nesting sites, year after year. 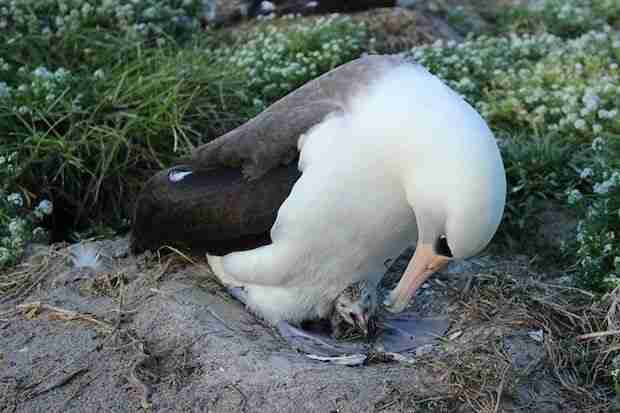 During the nesting season, the female and male albatross take turns foraging while the other cares for the chick. An albatross will lay only one egg per year, and its believed that Wisdom has raised at least 30 to 35 chicks, possibly many more.